As with any technology, everyone thinks that they know best and so go about an idea in different ways. Apple makes its iPhone, Samsung makes its galaxy, and each says theirs is the best way to go about it. And so it is with hybrid cars. Some use a small combustion engine to aid the battery power, some use a battery to help iron out imperfections in the combustion engine. All of this leads to consumer confusion, which requires some digging to be done. So if you don't know anything about hybrid cars, then sit back a minute and let us demystify it a little for you. , hybrid engines are supposed to be the best of both worlds – only thankfully unlike Jeff, they're less hairy and won't destroy everything around them. As simple as the basic idea is, what Porsche is doing isn't the same as Toyota and so on. But as the term 'hybrid' suggests, it simply means a combination of two things. In this case, hybrid simply means a combo of a regular fueled internal combustion engine and a battery power unit. So you either have petrol-plus-battery or diesel-plus-battery, but the base idea is the same: fossil fuel + electricity. There's also a difference around where the power for the battery comes from, and a combination of different ways can be used, such as from the engine overrun or harvesting power using regenerative braking – like on a modern Formula One car. But as consumers get their heads around alternative powertrains, so too are they getting to grips with the idea of a plug-in hybrid becoming more popular. On say the Porsche Cayenne E-hybrid or the VW Golf GTE, for example, you can recharge the battery in the other ways already mentioned, or you can simply plug it into the mains electricity. So you can, if you want, literally charge it up from a wall socket in your home, and then off you go. You can drive on just battery alone, but again it's slightly confusing. 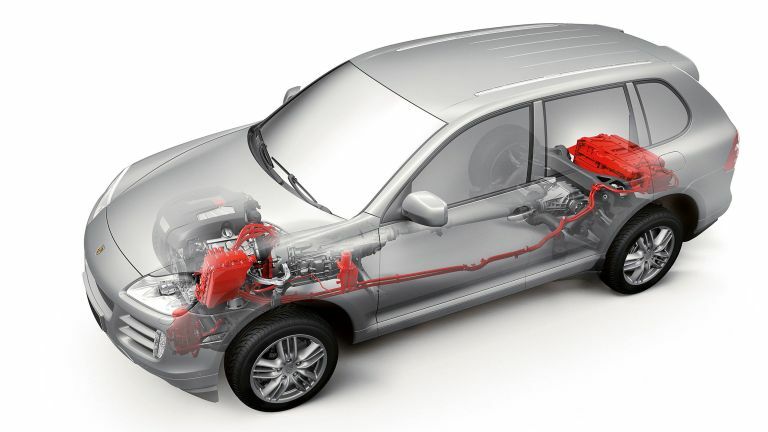 Some hybrids use a little electric motor to improve the efficiency of a 'normal' combustion engine, and some use a regular engine to improve the range of a large electric motor that powers the wheels – again, no one can agree on what's best. Using the Porsche again as an example, you can choose when to use it in battery only mode, and drive around whisper quiet like Knight Rider's K.I.T.T. which is, we have to admit, a cool thing to do – you can also do this in McLaren's bonkers hypercar, the P1, which is frankly freaking awesome! You'll then find that the car does what's best depending on what situation you're in, if you've got a charged battery. So at motorway speeds you'll be using the petrol engine, but should you arrive at stop-start traffic, it'll switch to battery power. This combination of power source use is where the term 'hybrid' is best understood – to use the best power unit choice in specific circumstances. So that's it, your introduction to hybrids. On the surface it seems like a murky world, but in reality once you've got your head around the basics it becomes much easier to get your head around. And this is exactly the sort of problem being faced by car manufacturers right now, that there's so many mixed messages out there that consumers back away from the choice and stick to what they know. As with everything, the best way to understand how it works is to use it, so even if you're not considering buying a hybrid but are interested, then Google 'book a test drive', sign up for one on a free Saturday morning and have a go.